Wish I’d known that verse before we left Destruction Bay. But maybe it wouldn’t have mattered. What I did know that morning …. God’s handiwork dazzled our eyes around every turn. It was too big to capture with a cheap camera. What I couldn’t know …by day’s end we would enter the darkest time I’d experienced to that point in life. Because blog posts shouldn’t be entire books…and because I’m thinking some of this should be a book so I can expand…and because I’m not writing a travel log…I’m moving quickly thru this next bit. Much of the next couple days were a blur anyway, with exceptions burned in memory. I’ll focus on the exceptions. As pleasant as the Mounty was at the BC border …his U.S. counterpart at the Alaska border was the opposite…rude, suspicious, unkind. Doug unpacked a lot from the back of our truck for inspection. As feared, we couldn’t get it all back in so stowed tire and tow chains under my seat…other odds and ends filled the cab. With a sleeping child in my lap and Doug focused on a difficult stretch of highway, we rolled on. As we crested a ridge and started downhill, we were surprised to see another vehicle approach. We’d had the road to ourselves all day. The tractor-trailer rig, pulling a huge load of pipe, was moving fast…right down the center. I thought he would move over. At any moment. He did not. Doug moved as far right as he could. The trucker stayed on center. The two lane highway had no shoulders and steep ravines on either side. It felt like forever, but I’m sure it was only moments as Doug battled the inevitable. Our right front wheel went off the road. With one last effort to keep us from going in head first, Doug cranked the steering wheel hard…brought the front tire back up as the rear end of the truck swung out, over the road’s edge, then down. Rear wheels downhill, front wheels uphill…we were positioned like astronauts for take-off. The truck slid sideways thru the snow about 50 feet until something snagged the tires and flipped us on to the passenger side. Then we stopped. Then it was silent ….for a moment. The mad scramble began… we had to get out. Doug smelled gasoline. I couldn’t move. I handed Ian up to Doug. He climbed out, dropped into the snow, climbed up to the highway to deposit Ian. I discovered the tow chains stored beneath the seat had wrapped themselves around my legs. As I worked at the chains I could see my tiny child standing on the edge of the highway…screaming hysterical, shaking, his arms reaching for me. I stared out that windshield, eyes laser-locked to Ian’s, and I could not believe how this place had drawn us in. This place so beautiful, had turned into a nightmare. I was wrapped in the most helpless, hopelessness …tighter than the chains on my legs. As Doug got back to me, a car pulled up and a man swooped Ian into a blanket… we got the chains off and me out… and we stood in disbelief on the side of a highway in the middle of a frozen nowhere… our life lay in a heap at the bottom. Of course, I know now that really wasn’t so. Our life was us…. whole and together. The only physical injury was a cut on my hand. But at that moment, I felt as God-forsaken as the scene looked. This man and family….returning to their home in Fairbanks, took us up the highway to 40 Mile Roadhouse. They helped us settle in, get a room, eat a meal, then they were off. Their kindness was soothing. We had nothing but ourselves. A state trooper took Doug back to the truck and they gathered whatever would be immediately useful…a few clothes, diapers, food, my bag which held all our important papers and money. He helped Doug make arrangements with a tow service for the morning. He gave us his number to call if we needed medical help… anything at all… he’d do what he could. The trooper and the family from Fairbanks were the kind of people we’d read about in the north country…. not the border agent… not the trucker who didn’t stop to see if we were dead or alive. Nothing made sense to me at that point. Ian and I spent the next day in a cabin at 40 Mile. Doug and the tow truck driver headed to the scene… our version of “Destruction Bay”. We had no idea how anything would turn out. But at the end of that long day, I was overwhelmed to see the tow truck, with ours on behind. Doug was ecstatic. 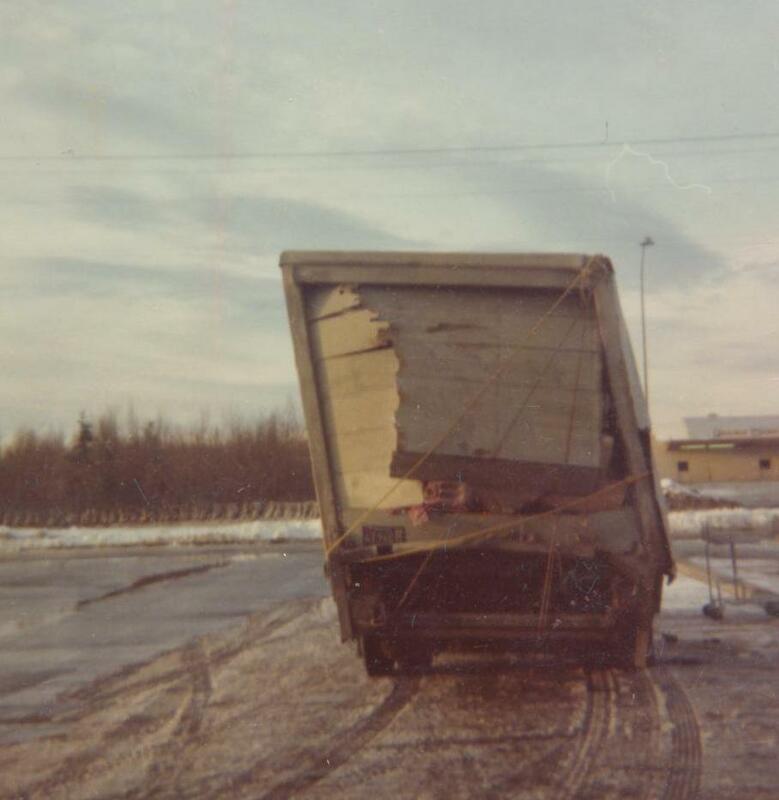 The fear was they would manage to pull the truck up onto the road, but all the contents would spill out the back. Nothing spilled. Everything made it out of the ravine. “In Him all things hold together”… our lives, our family…even the back door of a truck. The driver would pick us up in the morning and bring us into Tok. He was taking our truck to his shop there. We had no idea if it would be road-worthy. All we could do was celebrate one small victory and pray for the next step.